There is one enormous, overarching reason why every video you create should be carefully tracked. One reason so all-encompassing, so indescribably important, that its very definition denotes its value. That one big reason is money. Again, so we’re clear: anyone that looks to increase revenue, or to decrease costs, be it a business, non-profit, or individual, should be concerned with tracking their videos. There are many different ways you can embed videos on your site, and we’ve covered three of them in the recent past. You can host your videos for free on YouTube (and track them using our code), or you can host and track your videos on your own site using either jPlayer or Video.js. There are even more alternatives, but these should over most anyone looking to add video to their site. Once your videos are properly hosted and are being tracked, it’s time to start asking questions. Do they make any difference on my site? Do they increase revenue when my visitors view them? Do they increase revenue but not enough to cover my cost of production? Really dig into the data, and don’t let vanity metrics distract you from greater truths. More than once I have seen a client convinced that users loved their video content, only to track these videos and see that not only were people not watching them, but when they were it had no effect on their overall likelihood of conversion. That’s reality, though; analysis is not forgiving. It can be brutal to see 0% conversion next to something you believed was important. On the flip side, the same analysis can sometimes finding content that increases the likelihood or value of a visitor converting. And even if you find out that your videos were a waste, you’ll be able to save money you might have invested in more video content in the future. I see data in YouTube. Why track in Google Analytics? Most video hosting sites will provide tracking within their service, usually amounting to little more than the number of plays your video has received. Some services provide more, including YouTube, which has a number of interesting additional data points to sift through. However these are all disconnected from your own site and your own conversions. Although your average daily views, number of unique viewers, and how long people watched your videos for can be important, most of the time these numbers amount to no more than vanity metrics. What is the value of knowing your average daily views when it is completely disconnected from your goal completion and e-commerce conversion? So what should you track, and why? 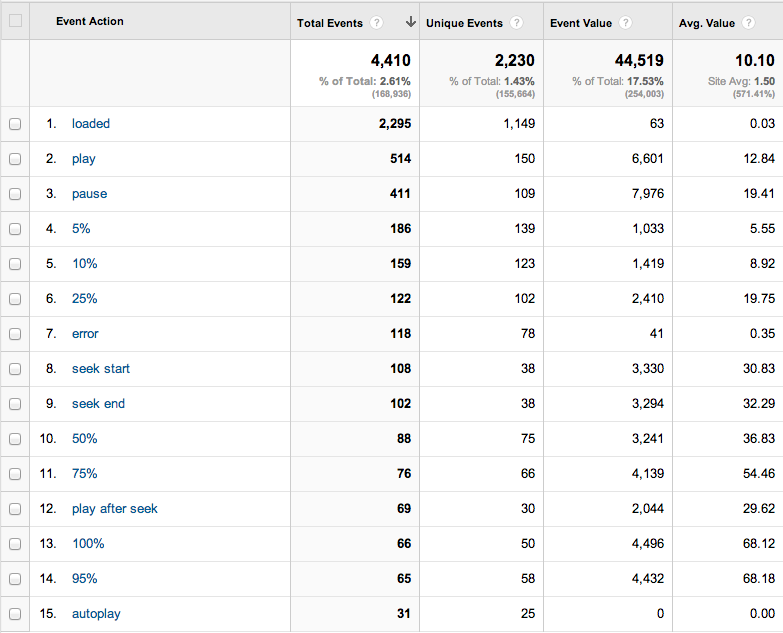 Play vs Auto-play: You should track when a user plays a video and when it auto-plays on the site. This is your obvious indication that the user has started seeing a video. Just visiting a page doesn’t mean they viewed the video. There are occasions when the user may not actually see the video or hear it, such as when they have their sound muted and the video is below the fold. Try not to auto play videos that are below the fold, if you want an accurate representation of people actually seeing the video. One possibility is to play the video when the user scrolls down and it comes into view. However you do it, it is key to indicate in the data not just when the video is loaded on the page, but when the user views the video. Time Watched % vs Seconds: There are number of different ways you can track how long people watch the video on your site. Probably the best way in Google Analytics is to track certain percentage points of the video calculated when the video loads. Some video services, such as Netflix, have their own internal systems that track exactly where you are at any given point. Hence, why you can stop a movie on Netflix or even close your browser, and when you come back you can start that same movie up at exactly the same point you left it. However, with the 500 event hit limit in Google Analytics, we have to be a little choosy, particularly if you have many other events on the site. It wouldn’t work to track every second of someone watching a video, as then when you hit 500 seconds you run out of tracking for the user and their session. One solution is to track time watched as a percentage of the overall video length, such as 5%, 25%, 95%, etc. This breaks down a bit when you have videos of widely differing lengths such as 10-second videos, one minute videos, and one hour videos. Reaching the 5% mark of a 10-second video has a very different meaning than reaching the same point on a one-hour video. In these cases you could consider a combination of events, and order them in sequence such as “1 – five seconds”, “2 – 10 seconds”, “3 – 10%”, “4 – 25%”. You also want to have more events earlier in the video, when the steepest drop off for videos occur, with less tracking on the long tail of the video. While there will be drop off from 50 to 100%, it will be just a fraction of the drop off from the auto play to 10 seconds. In general I find it easy to go the 1, 5, 10, 25, 50, 75, 95, 100% route, and adjust accordingly for different videos. The 1 and 5% marks generally get a good feel for how many people have abandoned the video early on, while 10% and higher show users who are at least minimally engaged with the video. I like to record 95% simply because many people leave the video before it actually terminates, such as when credits roll. 95% generally gets those people before they leave and we can consider them a full view of the video. Pause, Stop, and the Back Button: Of course, we also like to track when people stop watching the video. If someone manually pauses or stops the player we can track that, and we should, in order to see engagement with the player. We can even indicate how much of the video they saw prior to stopping it. Later, it can be useful to break users into a cohort of those who have manually paused or stopped the video. However, this isn’t a foolproof solution; if a user hits the back button or clicks another link on the page, the best we can do is capture the last event they reached before leaving. Seeking From and To: On many players we can track when a user drags the scrubber bar to seek a specific spot in the video. This can help identify interesting spots of the video users are frequently re-watching, or segments which users jump to immediately. This is a somewhat more advanced level of tracking videos, as you are looking at specific user engagement within the video as opposed to overall conversion. Video Information: Although the event category is reserved for describing the type of event and the event actions are already spoken for with the above event types, we can capture even more information about the video using the label. This can be a great place to put something simple, like the title. If you’re feeling ambitious, I have recommended to clients more than once capturing the label as a concatenation of information. For example, you could capture the title of the video (in our example, “yellow commuter backpack”), comma seperated categories (products, backpacks, and commuter gear), the video length is 135 seconds, and it cost $100 to produce. So what groups the videos would I look at individually in order to gain insight about their value? First, obviously we would look at individual videos; are there videos that perform better than others? Secondly I would include the category of the video within the event label and then look at general categories of videos. Perhaps you have four or five different types of videos, such as product videos. This way you could compare videos for your sandal products versus your normal shoes. Another area to look at is the video length. If you capture the video length in your event label, you can compare different video lengths. For example, videos up to a minute in length, videos between one and two minutes, videos longer than two minutes, etc. Maybe longer videos don’t add up to better sales. The basic idea is to not simply assume that your videos are valuable and always remember to account for the cost of their creation. Track all your videos, tag them with their cost and categories, and analyze how your visitors use the videos. Pay attention to the return they give relative to their cost, rather than simply the conversion rate, or the average value, or even a vanity metrics like how many views it got. Video often is a great way to increase the conversion rate on your site, however, be sure to prove this with data, and use data to increase your conversion even more by making better use of videos on your website.